I’ve always loved to cycle, from the minute I learnt to ride a bike, I was off. In the school holidays when I was older, my mum would wave me off on my bike and not see me until dinnertime. I used to cycle everywhere. As a young adult I still had a love of cycling and owned a bike for many years. But somewhere along the line, life got in the way and my bike just sat in the shed until one day when moving house I sold it, knowing that I wasn’t getting the use out of it. The girls both have bikes and are starting to learn to ride them either with stabilisers for Holly and Alice completely on her own. They both love being out on their bikes and I’m now running behind them trying to keep up. I think it’s time to invest in a bike for me! At the start of the year Andy started running and now goes a couple of times a week, he has done really well and loves it. His friend who he runs with, loves to go on bike rides and he has been encouraging Andy to get a bike and join him. For these two reasons, Andy and I have been looking at buying bikes for ourselves. I would love for family bike rides to become part of our life and I think it would be good for Andy to take up cycling as a hobby. When it comes to choosing a bike, I’ve always had mountain bikes and in fact I always choose a man’s style bike over a ladies. I prefer the higher cross bar. Since I last brought a mountain bike, a lot has changed. You now have suspension to consider, wheel size and there is even electric mountain bikes. Halfords have recently brought out a Beginners Guide to Mountain Biking, and it’s full of great advice to help you choose the right bike. But once you’ve brought your bike, then what? Sam Fowler, a MTB coach shares with us some techniques on how to have the perfect mountain bike experience. What Andy is keen on is finding some mountain bike trails, where you can really test the bike and your skills without the worry of being on roads. Halfords have included trails all around the country, showing the level of the course. I know it will be the beginners for me! I’m really excited for the time when the girls have got to grips with bike riding and we can all enjoy a bike ride together. It’s a great way to get outdoors and make cycling part of your everyday. I picture us cycling in the summer and stopping of for a picnic somewhere, kicking the football about and then cycling home. Of course life is never quite as we picture it, I’m sure there will be a tantrum in the middle because I packed the wrong crisps, but we can all dream of the perfect life. Until then it will be great way for Andy to do something he loves and for me to no longer have to run behind Alice. Getting out as a family on bike rides is on our list for this year. We managed one bike ride last year and that was the first time I’d ridden a bike in about 18 years. Other than getting lost, the big one falling in nettles, Poppy crying and coming across a naked man on the towpath it was a success! I’m not a confident cyclist at all – we live in a really densely populated urban area and I’ve seen so many cyclists involved in accidents that it puts me off! If we ever move out of London it’s something I’d love to do! 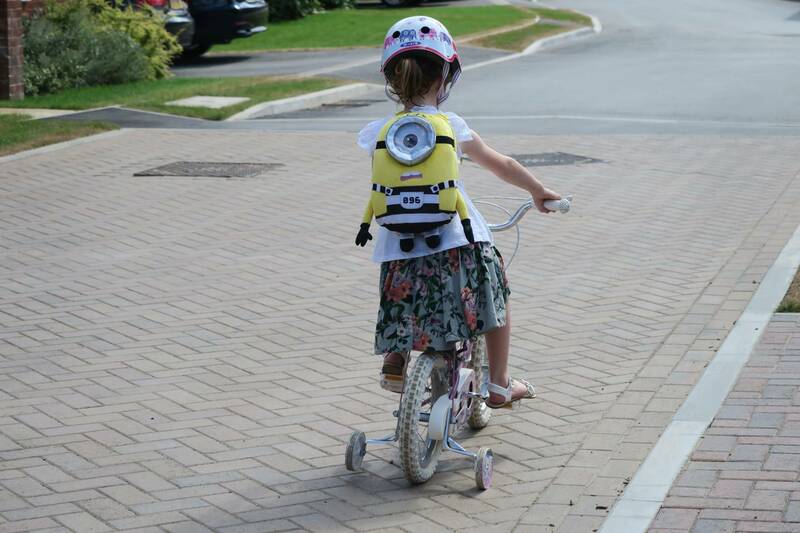 I wish I had a bike – my two eldest and my husband do. I’m the one that left out (with baby!) I think when my baby is older ill definitely invest! I have a bike and love it, but haven’t been able to cycle for a couple of years because it’s too much agony for my knee. N loves it, so if we’re round the park I’ll scoot along, or along the road will walk while he cycles. I need to take him to a trail, but somewhere I can walk as well as him ride. The only other issue with my bike is that it’s somewhere in the back of a barn. I can’t wait until we can all head out on our bikes for a ride in the woods! 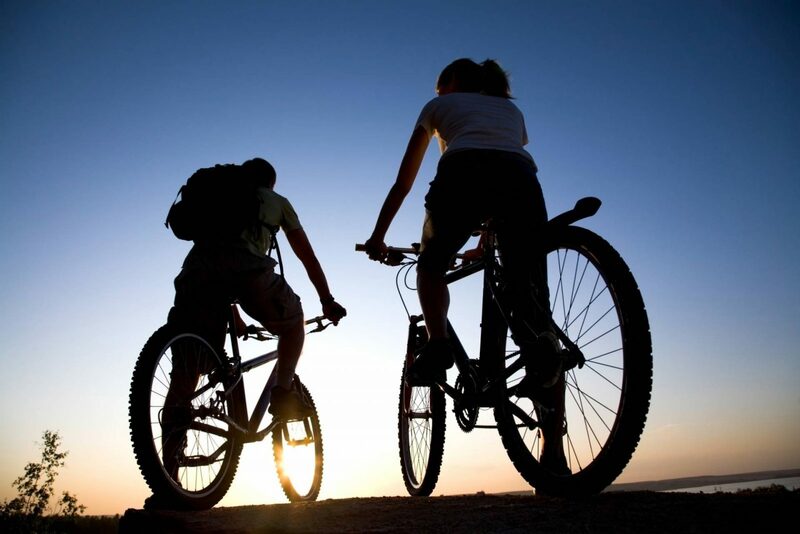 I have fond memories of doing just that with my parents, so a mountain bike is a must for me. We’re the same as you – neither of us have bikes, but my husband is starting to look into one for him. At least we have a few years to save up! We aren’t really bike riders but I think that’s a lot to do with the fact we only have one adult bike that has a flat tyre! We live near a huge country park with a canal so really, I dream of family bike rides along it! We actually love Halfords, we bought my eldests bike from there, they are really good. It is a lovely family activity to go on a bike ride together. I hope you are able to look forward to many of them. My family are all avid cyclists, and my mum and stepdad are cycling coaches. We have already had my daughter’s first balance bike and are now looking for one with pedals. We are going to check out what Halfords have! Cycling with the closest ones is always lots of fun, Laura! I also love cycling, especially with my friends. So interesting reading about your and your family’s experience with bikes!